Bannon to NYT: "Say the revolution is coming"
As the White House grapples with the political fallout from President Trump's remarks Tuesday that there were "very fine people" at the white supremacist rally in Charlottesville, Virginia, on Saturday, the president's embattled chief strategist said he hopes Democrats continue to highlight racial issues. Bannon, the former Breitbart executive who has in the past bragged about his connections to the "alt-right," told the New York Times he wants more statues to be torn down because he thinks it will hurt Democrats. Mr. Trump, in his remarks Tuesday blaming "both sides" for the violence in Charlottesville, also defended those who want to keep statues memorializing the Confederacy. The Charlottesville event was originally billed as a protest against the removal of a statue of Confederate General Robert E. Lee from a public park. "President Trump, by asking, 'Where does this all end' — Washington, Jefferson, Lincoln — connects with the American people about their history, culture and traditions," Bannon told the New York Times in an interview published Wednesday. "The race-identity politics of the left wants to say it's all racist," Mr. Bannon added. "Just give me more. Tear down more statues. Say the revolution is coming. I can't get enough of it." The New York Times published Bannon's remarks the same day the American Prospect published a conversation with Bannon in which he said, "we can crush the Democrats" by focusing on "economic nationalism." The White House claims Bannon believed the conversation was off the record. "The Democrats, the longer they talk about identity politics, I got 'em," Bannon told the American Prospect's Robert Kuttner. "I want them to talk about racism every day. If the left is focused on race and identity, and we go with economic nationalism, we can crush the Democrats." 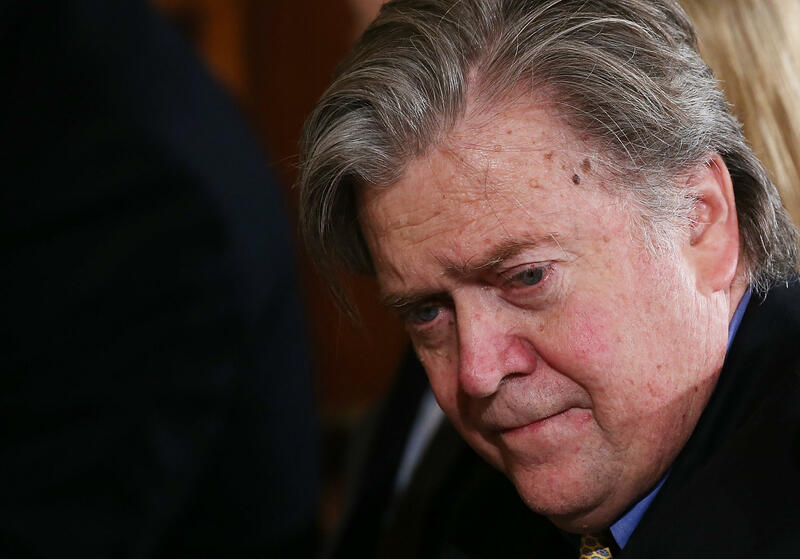 Several high-placed sources inside and outside the White House have told CBS News that Bannon's position has never been in more jeopardy, CBS News Chief White House Correspondent Major Garrett reports. Mr. Trump did nothing to ease those concerns about Bannon's future in his Tuesday remarks at Trump Tower, saying "we'll see what happens with Mr. Bannon." "Well we'll see – look like, I like Mr. Bannon, he's a friend of mine, but Mr. Bannon came on very late, you know that," Mr. Trump said on Tuesday. "I went through 17 senators, governors, and I won all the primaries. Mr. Bannon came on very much later than that, and I like him, he is a good man, he is not a racist, I can tell you that. He's a good person. He actually gets a very unfair press in that regard, but we'll see what happens with Mr. Bannon, but he's a good person, and I think the press treats him frankly very unfairly." Bannon, who has several rivals in the White House, lashed out against administration officials in the American Prospect interview. "They're wetting themselves," Bannon said of his adversaries in the administration who disagree with him on trade and economic policies.